Finally Royal Macadamias that live up to their name. Richly flavored with a texture that is both smooth and crunchy, these premium macadamias nuts will satisfy the boldest appetites, and please the most discerning palates. The Superior Nut Store's Royal Raw Macadamias will turn the most blah fare into an elegant menu. Try them the next time you need a simple way to make a meal memorable or snack time spectacular. 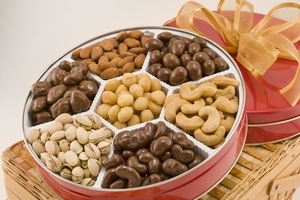 Start with the Executive Assortment of Nuts Gift Tin which features Whole Macadamias Nuts in addition to Colossal California Pistachios, and Chocolate Covered Pecans, Almonds and Cashews. 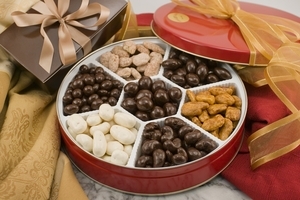 Or perhaps the Supreme Assortment of Nuts Gift Tin is the one for you. It spotlights whole macadamias smothered in a deep, rich Belgian dark chocolate accompanied by downright divine Dark Chocolate Covered Almonds and Pistachios. The mouthwatering macadamia nuts we all know and love originated in the rain forests of Australia, and is actually named for Dr. John Macadam, a noted chemist at the University of Melbourne. 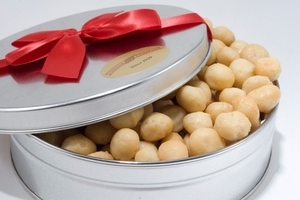 First introduced to Hawaii in 1882, the simple perfection of delicious raw macadamias is highlighted in the Royal Whole Macadamias selection: a simple, yet classic gift tin with a red bow overflowing with macadamia nuts. More than just nuts, Royal Macadamias can speak for you whenever you need to say congratulations, good luck, or welcome home.